"We hold these truths to be self evident, that all men are created equal. "—Declaration of Independence. And now, almost two hundred years after Thomas Jefferson wrote these words, America's dream of brotherhood, equality and tolerance is coming true. Integration bridges the chasm of racial intolerance and convinces us that the aspirations of our Founding Fathers were not wishful dreaming but functional democracy. By the Supreme Court decision of 1954, the bridge was constructed, spanning the last gap in the practical application of the ideal, "all men are created equal." And now, with the beginning of the school year, integration is in effect at Allegany for the first time. In addition to the many transfers from Carver high school, there are other new students, strangers not only to Allegany but to the customs and language of our country as well—a lad from Greece and one from Germany. Allegany finds itself a miniature "melting pot," with a wonderful opportunity to prove the meaning of "brotherhood, equality, tolerance." The motto of Maryland, "deeds, not words" is truly typified in the Allegany spirit, for students have learned in the classroom, on the football field and in organizations what can be achieved when individuals choose to respect one another, to work and to play together daily in amity and tolerance. All over America, others might look to these youth who are striving to cross the bridge and by so doing, help make the spirit of democracy truly live. Allegany has extended its hand. 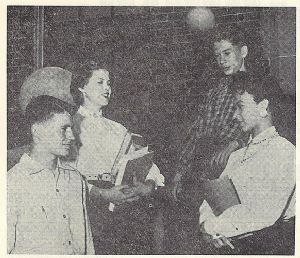 The front page of the September 28, 1955 issue of the Alcohi Mirror, the Allegany High School student newspaper, carried the headline, "20 Pupils from Carver High Enroll As Integration Begins". The article noted that these 20 students would be attending Allegany for the first time since the integration program was made effective in Allegany County. The editorial on page two of the paper entitled, "Crossing the Bridge", spoke of America's dream of "brotherhood, equality and tolerance" finally coming true after almost 200 years after the writing of the Declaration of Independence. Caption for photograph: Integration and internationalism are depicted in the above picture as Shirley Clontz, senior, greets George Paris from Greece, Jurgen Bless from Germany and Mary Louise Pope from Carver high school.